Ridgway Railroad Museum President Keith Koch and his wife sit at the Mt. Sneffels Press table at the Walgreens book signing. Rich Paar, the manager of the local Walgreens drugstore, is a supporter of local authors and conducts periodic book signings. He hosted another on May 7th, 2011, the day prior to Mother’s Day. He asked me to invite some of the authors of the railroad book to come along. Pictured is Keith Koch, president of the Museum, and his wife. 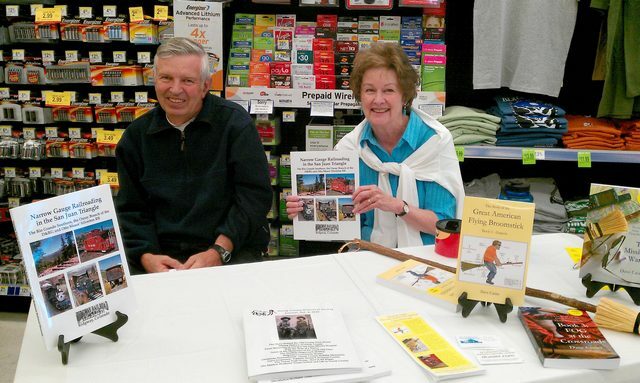 I sold three copies of the Flying Broomstick Book 1 during the sale—a slow day, but we all enjoyed meeting the public. This entry was posted in American Flying Broomstick, Mt. Sneffels Press, Our Authors, Railroad and tagged Ridgway Railroad Museum. Bookmark the permalink.